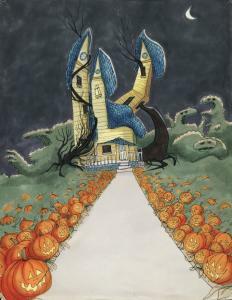 NEW YORK - Over the past few decades, Tim Burton has carved out a unique and paradoxical niche for himself. He’s a mass-appeal misfit, a much-loved loner, and his movies - the good ones, anyway - resonate with our inner freaks even as they exert their own freaky-deaky spell. A Burton film invites empathetic gawkery: We’re Edward Scissorhands and his tormentors both, drawn to stare and staying to share. In other words, we’re in love with the dark even as we’re afraid of it: On that tension, Burton has built a career. It also explains why the Museum of Modern Art’s “Tim Burton’’ exhibition, which runs through April 26, is usually a mob scene. Timed tickets to the third-floor galleries are necessary for weekends; when my family and I went shortly after New Year’s, the lines were longer than airport security. There’s something disconcerting about dozens of museumgoers craning their necks to look at works that channel so much pain into so much profit. Arranged more or less chronologically (some “Stainboy’’ webisodes from the early 2000s are on display in the entryway), the Burton exhibit makes a few unexpected claims. Unlike those “Star Wars’’ and “Lord of the Rings’’ roadshows that help bring crowds into Boston’s Museum of Science (the “Harry Potter’’ exhibit is the latest, not to mention the most dubious stretch), the MoMA show celebrates the art of a specific individual and, more than that, a sensibility. There are the expected movie props, costumed mannequins, and videos, yes, but the most revelatory galleries are the early ones that spotlight Burton’s high school and college artwork. He grew up in Burbank, of course, and it’s cheering to contemplate that one corner of morbid shadows amidst all the California sunshine. But Burton wasn’t a Pugsley Addams or a Gashlycrumb Tiny, at least on the evidence here. He seems to have been a typical nerdy SoCal kid who made stop-motion Super-8 movies starring action figures (“The Island of Dr. Agor’’) and his own pixilated self (“Tim’s Dream’’), and his early drawings reflect the steady influence of Mad Magazine’s genius flapdoodle, Don Martin. The weirdness starts to seep through in the sections dealing with Burton’s college days at Cal Arts and his subsequent employment as a Disney animator. Maybe the Mouse House’s institutional good cheer squeezed the morbidity out of his pores like black ink from a sponge, but the drawings become grimly jokey. “Sue and John Like to Hold Hands’’ shows a couple clasping a pair of severed hands, while a sketch titled “Never Shoot a Constipated Poodle’’ imagines the consequences of just that. Burton had clearly been exposed to the graphic art of Ronald Searle and Ralph Steadman by now, and the latter’s influence is clear in a blotchy pen-and-ink explosiveness that both masks and expresses real pain. By the early ’80s, Burton was working as an animator on Disney features like “The Fox and the Hound’’ and “Tron,’’ which can’t have contributed to his good mood. Work from around this era includes disturbing sketches of stick figures bursting apart in splatters of colored ink, perhaps symbolizing all the creativity the young artist had to keep inside. It came out in “Hansel and Gretel,’’ a legendary short film that’s the exhibition’s most valuable exhumation. Aired precisely once - Halloween, 1983 - on the six-month-old Disney Channel and promptly consigned to a deep pit in the back of Goofy’s house, “Hansel’’ is a cheerfully disturbed provocation that casts amateur Asian actors in all the roles, features a candy house that spews multicolored goops of blood, and stars an angry gingerbread-man puppet that demands to be eaten alive. Walt may have wept cryogenically frozen tears, but we’re lucky to have “Hansel and Gretel’’ finally back in the public eye. The next phase of the MoMA exhibit is dedicated to Burton’s subsequent short-film work, when his love of stop-motion and anything having to do with horror-movie icon Vincent Price came to fruition. So 1982’s wonderful “Vincent’’ is on display, and it presents the Tim Burton legend as the filmmaker would come to build on it: A tale of a suburban child with ghoulishness inside and shyness without. Price supplied the rhyming narration and there’s a small, welcome shrine dedicated to the actor in a corner of one of the galleries. After that, we’re off to the Hollywood races, with “Pee-wee’s Big Adventure’’ (1985) and “Beetlejuice’’ (1988) successfully launching Burton’s feature career. As a longtime devotee of the first film, it gratifies me to report that 11 of Large Marge’s increasingly bulbous eyeballs have been installed in a plexiglass wall case; good thing, too, since I might have had to resist the urge to pocket one. This part of the MoMA show is the standard memorabilia parade: costumes, storyboards, the scale character models known as maquettes. It’s not clear whether we’re looking at test figures for the “Nightmare Before Christmas’’ characters or the puppets themselves, but at least the show credits the artists, craftspeople, and other collaborators who were increasingly carrying out Burton’s singular vision: animators Rick Heinrichs and Stephen Chiodo, artist Joe Ranft, special-effects guru Stan Winston, costumer designer Bob Ringwood, and of course stop-motion animator Henry Selick, without whom “Nightmare’’ wouldn’t exist (he directed it, remember?) and who has since established his own career. These late-period exhibits are fun - look, it’s Ed Wood’s angora sweater! - without saying anything particular about what makes Burton tick. Each of the films gets a nod, even if they’re not very good, and the inclusion of, say, a battle helmet from the dire 2001 “Planet of the Apes’’ remake seems perfunctory. What the show charts, actually, is the dissipation of Burton’s art as it has moved further from self-expression over the years and toward a mainstream that has perversely embraced it, possibly to the confusion of the man himself. When we read a hand-scribbled production note that says “Edward [Scissorhands] is a robot but by all appearances he is very human,’’ we are glimpsing a specific human anxiety that, in an odd way, has been diverted by success. We can see right through Edward and Vincent and the Penguin and Jack Skellington to their creator, but who is Tim Burton now, and what does he look like when he’s happy?